Recent discussion regarding TMG has shown that a number of users would like to create a Research Notes Summary. This kind of report can be created in a variety of ways from TMG depending on how those notes are entered in your TMG project and data set(s). This article describes one way to enter the transcripts, abstracts, etc. 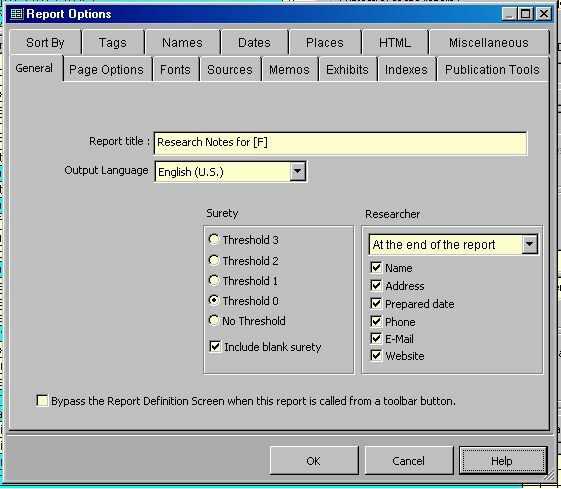 It also describes how to create the Report Definition so that the Research Notes report may be created as desired each time. The design of this method is based on the fact that many users enter transcripts, abstracts, etc. into TMG in various ways -- mostly to have handy for future reference. The question is how and where these entries need to be made. Some users will enter them as Exhibits, as parts of Tag Memos, and more. This method standardizes the entries to the Tag Memo field of certain Custom Tag. Thus the transcripts, abstracts, etc. need to be entered into the appropriate Tags which need to be created. I use a single Custom Tag for these entries. You may desire to have multiple Tags – one for transcripts, one for abstracts, etc. To create these Custom Tag Types, open the Master Tag Type List and click on the [Add] button to display the Tag Type Definition screen and make appropriate entries in the Label field and click on the Other Tag Group option as illustrated below. Custom Tags are used for this report so that these Tags can be excluded (if desired) from other reports. The dashed lines may be made any length. Particularly, you may want a longer line separating the actual transcript text ([M3]) and the comments header. For the Witness Sentence, enter two dashes "--" (again no quotes). The two dashes for the Witness Sentence ensure nothing ever prints for a Witness. I do not use Witnesses in this context although you may and thus you would need to change the Witness Sentence as best suits your needs. Now, click on the [OK] button to close the Tag Type Definition screen and actually create the Tag Type. Click on the [OK] button to close the window and create the Custom Tag Type. If there are other Custom Tag Types that you wish to create, you may do them now. I also created a special Tag to print a “division” line before or between Tag text in the report. The only difference is that I gave it a unique name (Label) and the desired Principal Sentence which is “[:CR:]===================”. The double lines part is just a series of equal characters and you may make the line any length you desire. 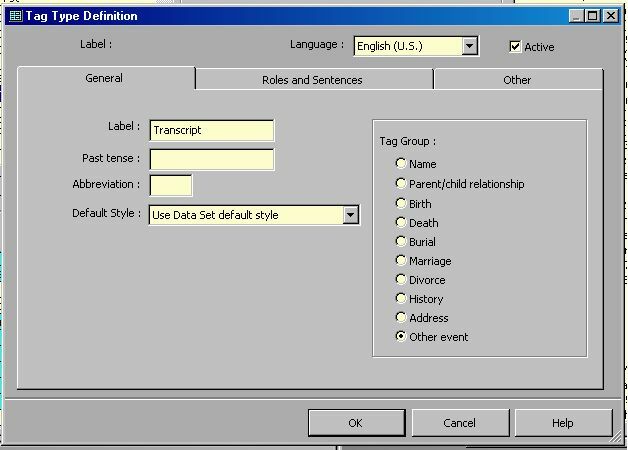 Other Custom Tag Types may be a separate Abstract Tag, Transcript/Abstract Header Tag(s), different divider Tag(s) using other characters than as shown above, a Transcript/Abstract Comments Tag. Since each of these would have their own default Principal Sentence, these added Tags may make the entry of Transcripts, Abstracts, Comments, etc. easier for you. In such a case, the basic Memo field entry below would need to be changed as needed to fit the appropriate Tags. This is all that is need to get you started. At this point you are ready to start adding your transcripts, abstracts, comments, etc. using the above Tags. So, for each event/Source with a transcript, abstract, comment, etc. add the appropriate Tag to the person. In the Tag Entry Screen, enter the appropriate Date (and/or Sort Date, if in Advanced Data Entry Mode). Add the appropriate Source Citation. Normally, only one Source Citation would be entered for these Tags. No entries need to be made in the place fields unless you have determined a use for such entries and in the Sentence. Now the actual transcript, abstract, and comments need to be added. I suggest that you expand the Memo field by clicking on the [Memo] button although you may type directly into the Tag Memo field, if desired. Again, where I have "--------------------------" and "============", you may prefer longer lines and/or different characters. These separate one transcript/abstract text, its header and its comments from each other and from the next set. I used the font above for Labels although you may want to use a different one and set it appropriately in the Report Definition Screen as will be described below. Keep entering transcripts, abstracts, and comments into the appropriate Tags. When you are ready to create the first report, click on the Report menu and select the Individual Narrative option. You may prefer a different report type and that would be fine. You just would need to adjust the following to accommodate that report style. a. Click on the [Add] button and enter a new Configuration Name (e.g., "IN - Research Notes Report") so that you can select to run the report again in the future without having to make the following changes each time. b. In the Subject(s) of the report area, make the appropriate selections. I have chosen to only print the report for the Current Focus Person in the SAMPLE project. c. In the Report Destination, select the desired output destination. I prefer to output to my word processor as that allows me certain added capabilities. Now, click on the [Options] button to display the report Options window. a. In the General tab, Enter "Research Notes for [F]" as the Report Title. b. Make other changes as desired. c. Click on the Fonts tab, then click on the […] button to the right of the Labels field and choose the Font, Font Style, and Size that you desire for the header lines of each transcript or abstract in the report. As noted above, you may prefer a different data type than “Labels”. Your choice may or may not cause a “conflict” depending on the report type that you choose. By “conflict”, I mean that other usage of that data type within the report may cause the report to turn out differently than you desire. Thus, you may want to use a different font data type. For the Individual Narrative report type, the Labels data type fits well and my selection causes the transcript header lines to be printed in bold letters slightly larger than the main text. This allows the reader to quickly scan the report and find a specific entry. My choice looks like this. d. Click on the Sources tab, and de-select all options except Endnotes. You may prefer Footnotes. 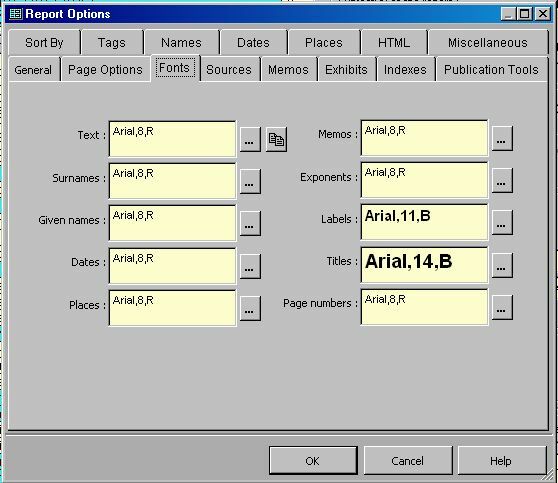 e. Click on the Publication Tools tab, and select the Bibliography option if desired. 1. Click on Selected under Tag Types to activate the Tag Types select list. 2. Click on the [Unselect All] button. 3. Scroll down the list, and double-click on (select) the Tags to include in the Research Report Summary. This would normally be only the Custom Tags that you created for use with transcripts, abstracts, etc. I have two such Tags selected below. 4. Click on the All variations or All events and witnessed events option. Below is how my Tags window looks. g. Make other changes that you wish and click the [OK] button to close the [Options] window. At this point, you may create the Research Notes report. If you are not ready to create the report, click on the [Save Setting] button to save the changes that you have made. 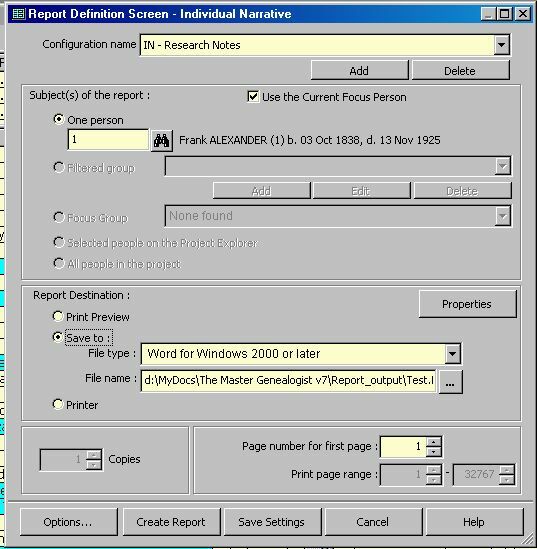 Then you just select the Report Type (Individual Narrative, or as you have selected) and then choose the right Configuration Name and click on the [Create Report] button. Note that the “transcripts” below (other than census) are example only and were derived from the SAMPLE project. There may be more or less to the real transcripts. Frank Alexander, 87, died at his daughter's home near Mt. Jackson, Virginia, after a short illness on Friday, 13 Novenber 1925. He had been visiting his daughter when he was taken ill, she was at his side at the last. In addition to his wife and his daughter, he leaves three sons, Samuel, Willie, and Frank;and four other daughters, Annie, Mary, and Lula. He was preceded in death by his wife, Mary, and a son, John. From 1861-1865, Frank Alexander was in partnership with Thomas C. Houts as proprietors of a men's clothing store in Elizabethton, Tennessee. In 1865, Frank and his father, John Alexander were proprietors of a men's clothing store in Marion, Virginia and the store remains in the family. In 1885, Frank became a minister of the Methodist Church and was assigned to the Holston Conference with posts in Union, Floyd County, Virginia (1885), Lebanon, Russell County, Virginia (1885-1887), West Jasper, Marion County, Virginia (1887-1888), Dunlap, Sequatchie County, Tennessee (1888-1890), Pikeville, Bledsoe County, Tennessee (1890-1898), Castlewood, Russell County, Virginia (1898-1900), and Blountville, Sullivan County, Tennessee (1906-1907). He was buried in Round Hill Cemetery following rites by the Methodist Church of which he had been a faithful and dutiful member and servant. it appears to have been published in the "Midland Methodist"
Alexander/Keebler family data. In Holy Bible. New York: American Bible Society, 1854. Original owned in 2000 by Lissa Soergel, 504 North Quaker Lane, Alexandria, Virginia 22304-1827. Burgner, Goldene Fillers, compiler. Carter County, Tennessee, Marriage Records, 1796-1870. Easley, S.C.: Southern Historical Press, 1987. Family Bible of John Alexander and Delilah Woods<, [CD]>. Houts, Mary (Alexander), letters. 1935-1939, from Ooltewah, Tennessee, to Louise (Baldwin) Waterman. Held in 2000 by Lissa Soergel; 504 North Quaker Lane, Alexandria, Virginia 22304. Midland Methodist (? ), 25 Nov 1925. Tennessee. Carter County. 1840 U. S. census. Micropublication M704, roll 518. Washington, DC: National Archives. Tennessee. Carter County. 1850 U. S. census, free schedule. Micropublication M432, roll 873. Washington, DC: National Archives. Waterman, Louise (Baldwin), Research notes and personal communications to Lissa Soergel, 1934-1983. Notes held in 2000 by Lissa Soergel, 504 North Quaker Lane, Alexandria, Virginia 22304-1827. Frank Alexander obituary, name of newspaper lost, possibly Midland Methodist. 25 Nov 1925. Family data, Alexander/Keebler Family Bible, Holy Bible (New York: American Bible Society, 1854); original owned in 2000 by Lissa Soergel, (504 North Quaker Lane, Alexandria, Virginia 22304-1827). The Frank Alexander Family Bible passed from Frank to his daughter, Carrie (Alexander) Barns; to her nephew, Allen Long; to his cousin, Lissa Soergel (great-grandaughter of Frank Alexander). John Alexander household, 1840 U. S. census, Carter County, Tennessee, page 174, line 19; National Archives micropublication M704, roll 518. John Alexander household, 1850 U. S. census, Carter County, Tennessee, free schedule, 8th Civil District, page 210, dwelling 45, family 45; National Archives micropublication M432, roll 873. Louise (Baldwin) Waterman (Goodwin House, Alexandria, Virginia). Research notes and personal communications to Lissa Soergel. Notes held in 2000 by Lissa Soergel, (504 North Quaker Lane, Alexandria, Virginia 22304). Mrs. Waterman is now deceased. Family Bible of John Alexander and Delilah Woods. Goldene Fillers Burgner, compiler, Carter County, Tennessee, Marriage Records, 1796-1870 (Easley, S.C.: Southern Historical Press, 1987). Letters from Mary (Alexander) Houts (Ooltewah, Tennessee) to Louise (Baldwin) Waterman, 1935-1939; held in 2000 by Lissa Soergel (504 North Quaker Lane, Alexandria, Virginia 22304).